The 2018 1/4oz Gold Krugerrand is the preferred choice of clever investors. Buy this affordable version of South Africa's official bullion coin as a gift for someone special, or give your stock portfolio an instant boost with handy tubes of 50. Each coin has all the same great design details as the world-famous 1oz Gold Krugerrand. 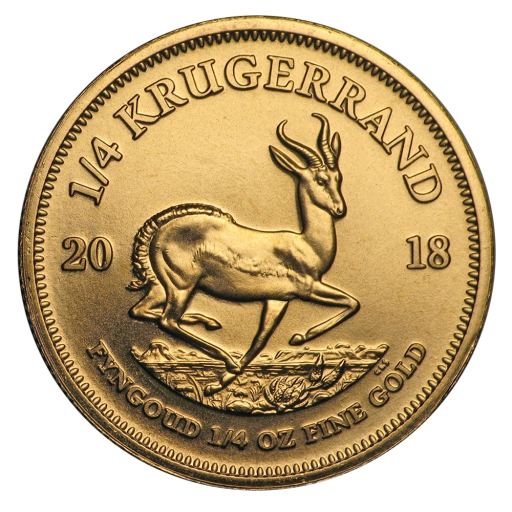 Gold 2018 1/4oz Gold Krugerrands are valued for their beauty and heritage as well as for their gold content. Add one of the world's most famous gold bullion coins to your basket now with coininvest.com.